[New for 2014] Do you guys remember when I use to review Pierre's products? They're yet another ice cream company out of Ohio (that makes 4 we cover!) and they make my beloved Hola Fruta sherbet and the fun Yovation product line. Well, on a whim, I decided to see if my old contact at Pierre's was still around, and sure enough, he was! We chatted about their new signature collection which we'll review soon, but you guys know I have a soft spot for charity inspired flavors, so we're going to start with a limited edition flavor from their premium line up. 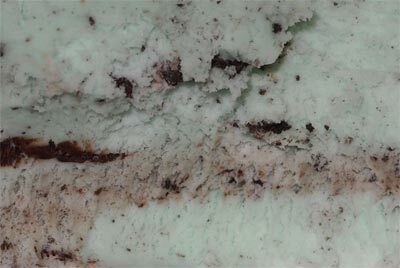 At first, this ice cream that benefits Cleveland Metroparks Trails Fund looks like any respectable cookies & cream flavor. 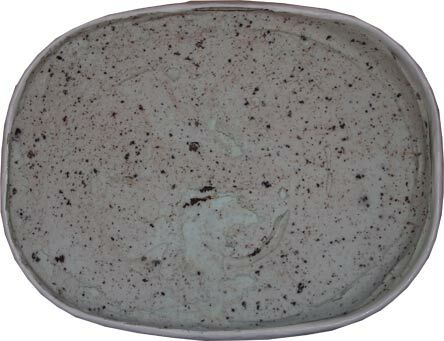 Check this out, you can actually see how the cream of the cookie lightened the color of the base ice cream. It definitely solves the question "are you sure they used cream filled cookies?" I know I tend to use non-food terms to describe my ice cream, but you know that won't change anytime soon. Today, I need to say this. There is a maturity to this ice cream that I was not expecting. Recently having that fluff that is Breyers Mint Oreo Blasts, I wasn't really prepared to shift back to a respectable product like this. For one, the texture is spot on for a mainstream (premium) ice cream. No gum, no grit, just a nice quality freezer aisle style ice cream that can be hard to find sometimes. More importantly, the flavor does not disappoint. 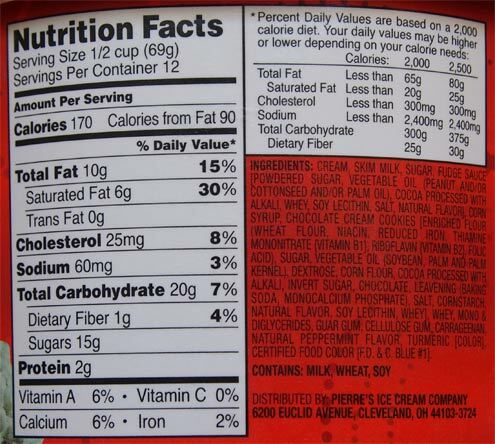 Every now and then, I get a comment like "why do you pick on Breyers thin mint flavor?". Why? WHY? 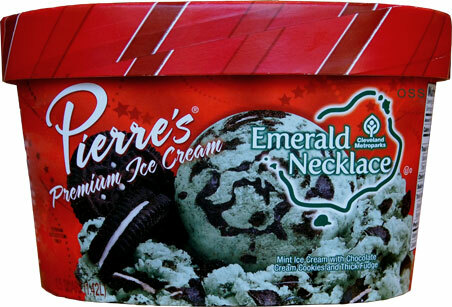 Because stuff like Pierre's Emerald Necklace exists. Going back to how this conversation started, the fudge swirl adds this awesome maturity to the overall flavor. This isn't some effervescent smack on the taste buds. Instead it's this pleasant mint with this cookie & fudge factor that has you really thinking about the wonder that is a thin mint. It's not batting me over the head with it, instead, it's going "hey, why don't you sit back and chill, you know, take smaller bites of your cookie so you really take the time to notice the difference between the chocolate coating and the cookie crunch". Does that make any sense? This has been my first true test of Pierre's and they've done an excellent job. This doesn't feel like some dumb new limited edition gimmick flavor, this feels like something they've perfected many moons ago. If you wanted to convince people that mint ice cream is a good thing, this is the kind of flavor you start with. Excellent job Pierre's. On Second Scoop: Ok, I know I was probably talking a little loopy there because I was excited, but you get my point that I really like this flavor. Sometimes we talk about a flavor's ability to keep us entertained. Yes, a flavor that is good in every bite is fine, but sometimes you want a bit of surprise on that next bite. Am I going to get a nice mint cookies & cream? or will I hit more of the fudge on this bite? I love when cookies & cream gets the respect it deserves and it gets that respect here.